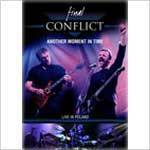 DVD+CD - Final Conflict recorded live for the first time ever! More information: Final Conflict finally available on DVD! Footage documenting a great concert at the Wyspianski Theater, featuring a selection of some of the best songs from the bands musical career. A wonderful vocal combination of Andy Lawton and Brian Donkin (the bands founders), great songs, full of sadness and angst with a pinch of the theatrical and at other times full of hope and overflowing energy. The DVD also features 2 interviews (one with Andy Lawton and Brian Donkin and one with Henry Rogers and Barry Elwood), Dolby Digital 5.1 Surround Sound and more. Special edition limited to 2,000 copies.